He was the forgotten man. The only person who knew the amount of work he did was Michael Rodgers. In every interview Rodgers thanked Martin and Van Garderen. I watched every stage of the Tour of California. Tejay was the constant domestique. During the Big Bear stage he pulled just as much as Tony Martin. I kept waiting for Phil and Paul to give him a shout out but it was always about TMartin. Tejay covered moves from Brajokovic (sp), Hesjedal, and Horner. If he wasn't in the move he'd slowly drag Mick Rodgers back to the group. In the time trial, Martin won and deserved the accolades, but once again he over-shadowed his teammate. Tejay was 15th, one place ahead of Cancellara....after the hardest stage of the race in which he pulled 25% of the time. 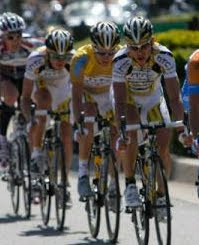 During the final stage, Levi was lighting it up and Rodgers was covering. Zabriskie bridged the gap, and there was a second group on the road. Who was leading that group of 4? Tejay. He pulled eventual stage winner Hesjedal, Sutherland, and Zacijeck until Hesjedal attacked and bridged the gap. Tejay has a bright future. Velonews and a couple other media outlets are starting to see that, but I was disappointed in the lack of coverage. In an American race, we had a great young American rider which no one seemed to notice. What was the difference in Rodgers beating Levi for the first time in 3 years? A killer tt performance and two incredibly strong teammates in Martin and Tejay. Shout out to our Montana hero, Tejay Van Garderen. Maybe the mainstream cycling media doesn't see it yet, but Montana does!